Inka Terra Machu Picchu or Machu Picchu Sanctuary Lodge ? MP Sanctuary lodge is close to Machu Picchu, so you can spend more time there. Inka Terra is more comfortable though. One of the cheap but good restaurant is Chez Maggy. 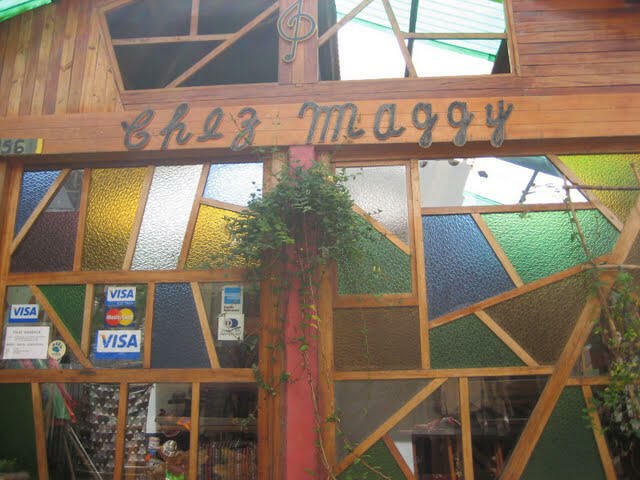 This one is the branch of Chez Maggy of Cusco. It's soup and Pizza is very good. Even if you are not pizza lover, you will probably like the pizza here. Chez Maggy is located on Av. Pachacutec. While you walk toward the thermal springs, you will find this restaurant on your right side. You can find Peruvian and Mexican dishes here, but this place is more popular for brick oven Pizza.